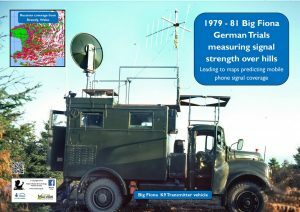 In the 1970s & 1980s -The Non Communications Section was primary concerned with land based Electronic Support Measures (ESM) equipment for the detection of ground based Warsaw Pact targets. 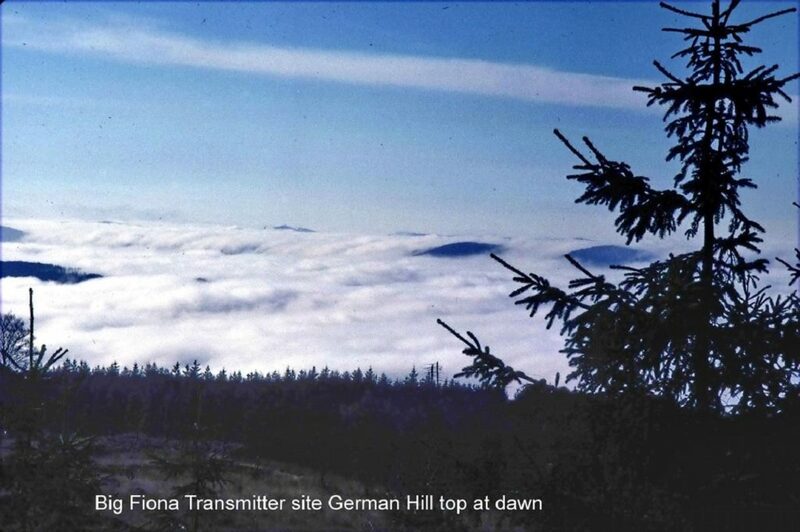 The Army ESM equipment was usually deployed in the 1 BR Corps area of Germany, the southern half on which is so heavily ridged with hills that the probability of line of sight between the ESM receiver and the target was low. Therefore, the behaviour of microware signals propagated over terrain obstacles was of paramount importance in a ground to ground environment. At the time, computer models of this phenomenon were either non-existent or produced poor results. 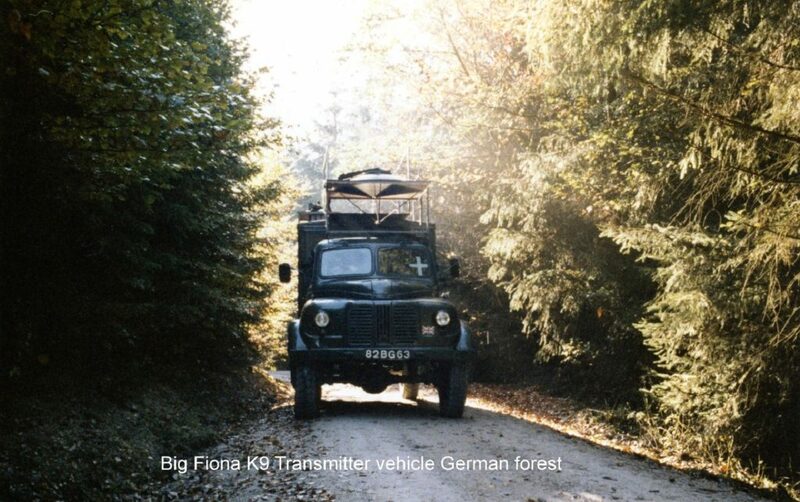 In the autumn of 1978, RSRE carried out a major trial – Big Fiona- with aim of producing a better model for frequencies between 2 GHz and 17 GHz. 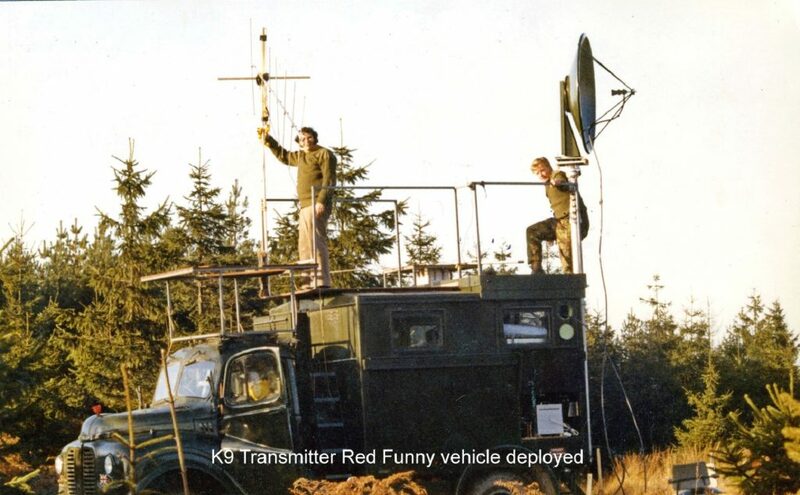 The trial was carried out with two old K9 vehicles provided by DOAE, one containing the transmitters and the other the receivers with two land rovers in support. 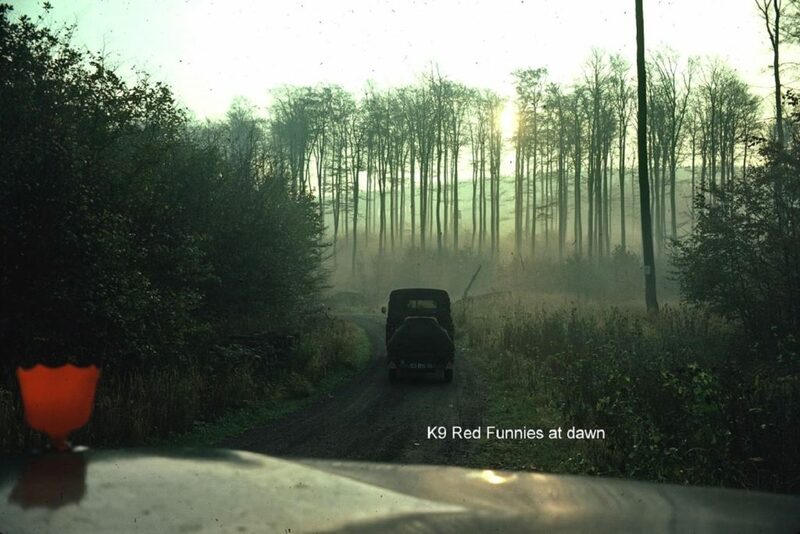 Because the K9s were not HGV, they were driven by the scientists. The route was from Malvern via Dover – Hook of Holland- Brussels- Osnabruck- Hannover, to the area around Hildesheim in Germany. the three week trial and the problem was not found until the return to Malvern, when after a complete examination of the fuel system a pin hole was found in a fuel line covered by a fleck of paint. The moral of that story is use your own vehicles. One of the support land rovers was driven by Lt Col Gavin Mackie with a scientist as passenger. The vehicles were always driven to the nearest local British Corps barracks to be accommodated overnight. At one barracks we arrived late at night with our odd vehicles.The guard took a close look at the driver and noticed that he was a Lieutenant colonel, snapped to attention, saluted and waved us through. We heard later that he thought the civilian must be extremely important if he was being driven by a Lieutenant Colonel. The trial coincided with the Army exercise season therefore our vehicles had to have white crosses on the windshields to mimic the Army exercise umpires to avoid any unwarranted attention from the MP’s. We also put plastic ice cream containers on the bonnets so we became known as the Red Funnies. bizarre vehicles and civilian dress. The trial was a success and the results produced a computer programme allowing intercept coverage diagrams to be produced using the latest digitized terrain data for the 1 BR Corps area. 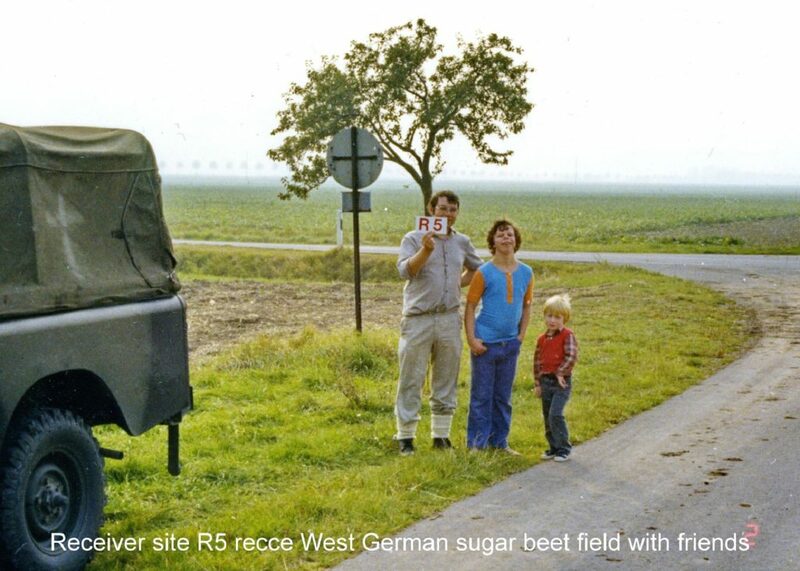 In the spring of 1979, the British Army of the Rhine (BOAR) requested a feasibility study to determine whether K-band (30-40 GHz) radars could be intercepted. GS(OR)6 then requested that RSRE carry out a trial aimed at extending the propagation model to K-band. 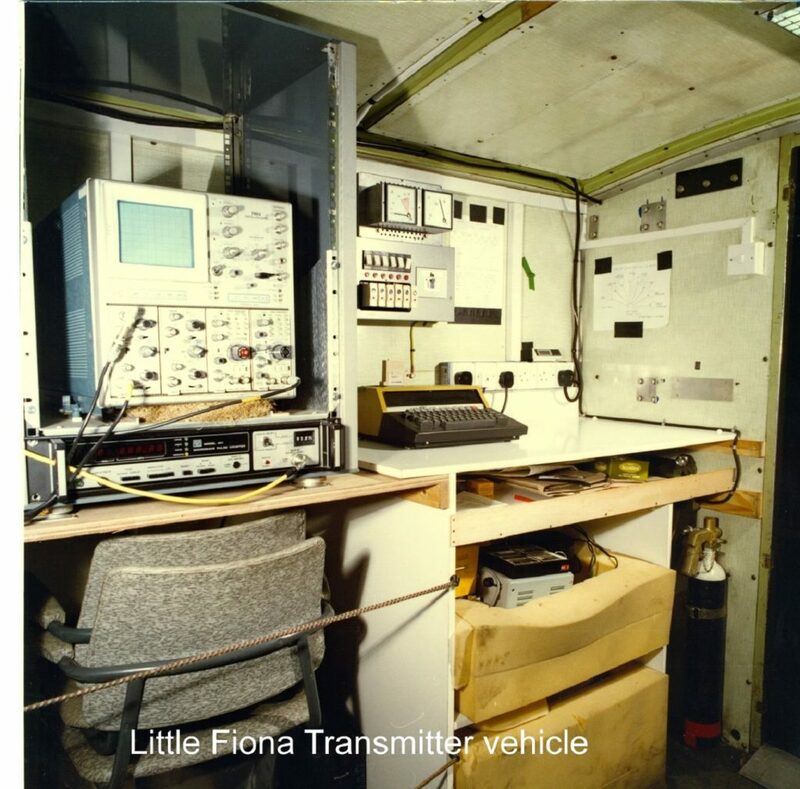 This resulted in the Little Fiona trial carried out in June 1983. It was also used to validate the model at X Band. Preliminary work involved finding and recceing transmitter and receiver sites, sometimes to much interest from the local population. All the K & X Band transmitter and receiver systems were built in house and scissors lift platforms were used to speed up deployment of the complete system as many sites had to be covered. 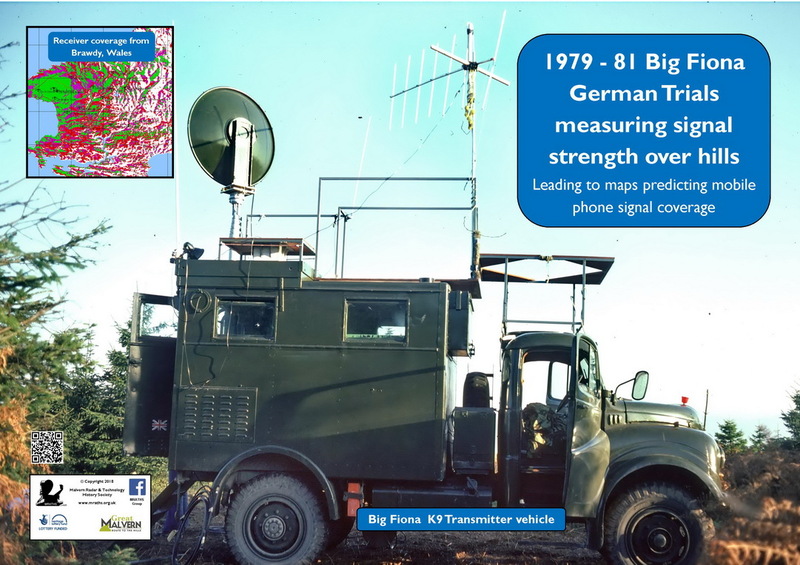 This time 4 tonne Bedfords were used as transmitter and receiver vehicles so RSRE drivers were used and to minimize driving we sailed from Harwich to Hamburg. It was rather unfortunate that on the first day of the trial, as the Tx vehicle rounded a corner on the German forest roads, it slide into a ditch and the only thing keeping it upright were the pine trees on the track side. It could not go forward or backwards without tipping over. It was not a good start. Having lit a pipe to allow time to come up with a solution, it appeared possible to get it back on the road, if a rope was attached to the eye on top of the cabin at the back and the other end to the tow bar of the Landrover, which then inched its way forwards, keeping the rope taut at an angle of around 40 degrees, to the Bedford vehicle slowly reversing, it pulled it upright away from the trees, much to relief of everybody. Trials days were very long and did not allow much time for domestic duties, so drying the washing had to take place when ever a moment was available. 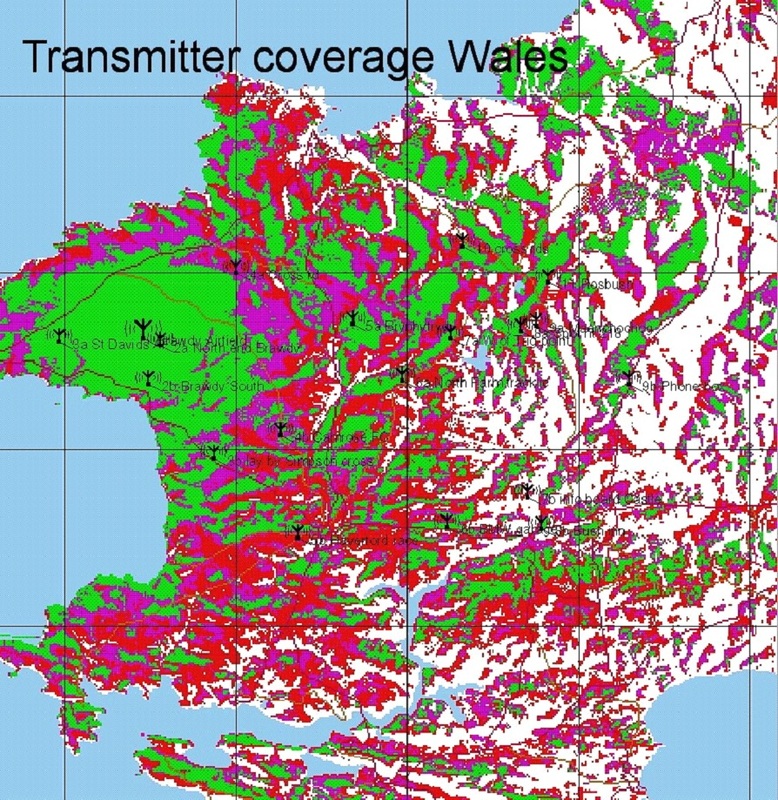 The measurements allowed the computer model to be extended to higher frequencies and together with the appropriate digital terrain database estimates of the likely coverage of an ESM system to be made. 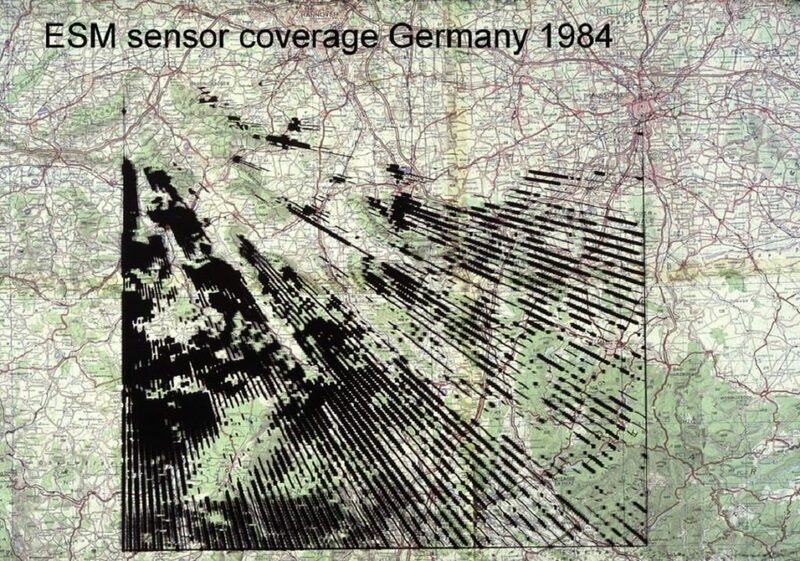 It became a standard tool for predicting ESM intercept or trans- mitter coverage wherever a digital terrain data base was available. This type of model became increasingly important for siting of mobile phone masts and coverage of digital television.